Excellent to hear the man himself speaking in person this year, rather than via video link as at previous moots. Martin is normally invited to give the opening keynote at these things, but this time was allowed a lie in on the Tuesday, to recover after Monday’s ‘hackfest’. Martin spoke for close on two hours, covering a whole range of stuff from Moodle’s philosophy through to a ‘brain dump’ of the development roadmap and related projects. The AV record is online, and there are excellent notes of most of the roadmap stuff from Jason Handro on moodle.org, so the following notes are really just the personal highlights. By understanding the contexts of others, we can teach in a more transformational way, and thus Moodle has lots of ‘social presence’ tools missing from other learning platforms. A learning environment needs to be flexible and adaptable, so that it can quickly respond to the needs of participants – hence Moodle itself would really only make sense as an open source project. Martin’s vision for Moodle fits closely with open source philosophy, with the notion that the people and the right software tools together make up a community, which in turn achieves it’s extrinsic goals (in this case, teaching folk), but also feeds back to improve the code. Martin reckons that there are now 3000 or so Moodle downloads a day (I dread to think of his bandwidth charges), with over 13,000 registered sites in 150 countries, with 840,000 teachers and 5,000,000 registered students. Teachers are now outnumbering system administrators in the Using Moodle community, with 9% now independent teachers – which is interesting in light of Jason Cole’s earlier comments. 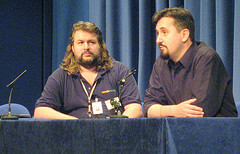 Martin is absolutely committed to maintaining Moodle as open source under the GPL, and it’s this vision which has allowed it to become what it is, through incorporating work done in a whole host of organizations to meet particular needs: there are now 117 developers with some CVS write access working on the project, and plenty of others submitting fixes, mods and contribs via them, thanks to a very accessible, modular design: Martin mentioned an English teacher who’d had a look at the code to figure out how to fix a particular issue, and then six months later was contributing module code. The business model is built up around providing services, such as hosting, consultancy and training, but not content, which folk are writing themselves, importing from elsewhere, or working with other folk to develop. Although there’s nothing to stop any company offering these sort of services, Martin has control of the “Moodle” trademark, which has come in for some criticism on Moodle.org and in SF-UK, the commercial use of which is restricted to the Moodle.com partners, who contribute directly to Moodle’s ongoing development, normally through a 10% levy on their revenue. My perception is that Moodle’s development started off with meeting the needs of individual teachers and their students, but as it’s evolved we’re seeing more attention paid to institutional, and indeed system wide (Martin mentioned an anonymous Asian country that’s about to put Moodle into _all_its schools!) requirements, much of which cluster around interoperability and standards compliance. Martin gave an impressive list of the standards stuff, but it’s interesting that his focus was on broader web type standards than the latest specs from IMS, although there’s now a full time Moodle HQ developer working on the SCORM stuff, and IMS-LD is a priority, despite Moodle doing lots of stuff which the IMS-LD team haven’t dreamt about, so you’ll be able to port whole Moodle courses to other IMS-LD compliant systems (if anyone writes one! ), although you’ll lose some of the functionality in the process, unless you restrict yourself to the subset of Moodle’s modules that are on the IMS-LD list. Import from other IMS-LD systems shouldn’t be a problem though, or at least wouldn’t be if there were any. 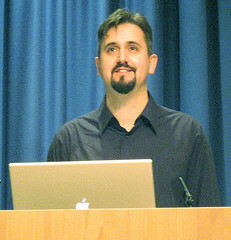 Martin’s quite proud that the development roadmap is a public document, unlike those in the commercial sector, and acknowledges that the community has an increasing say over the direction in which Moodle heads, perhaps particularly when large organizations are able to fund aspects of the development themselves, as we’re seeing with the OU’s backing for the roles and permissions stuff – indeed, had Becta and the DfES been a little more supportive of Moodle as one of the UK’s Learning Platform solutions, then I’m fairly certain that they could have ticked off most of the stuff on their wish list for a fraction of the cost of the commercial procurement exercise. The modularity of the code is crucial here, and Martin described Moodle as ‘an e-learning operating system’, allowing institutions and teachers to use those bits they want and safely ignore the rest. Martin listed a few highlights of the long delayed 1.6 release. He’s proud of the database module, which is a very flexible tool, although the need to code up templates presently makes it a bit too techy for many teachers, however he’s looking to develop some sort of template repository, and sees the glossary module becoming just an instance of database in future versions. Moodle’s blog system is in place, although the absence of commenting is causing some concern – comments are on the agenda, but there’s still no clarity about how to do this. The plan is to allow RSS based import of content from elsewhere here, including filtering by tags, so users can use any blog engine to author content for the Moodle blogs, which may sound familiar to fellow elggists. The MyMoodle dashboard looks set to grow too, and Martin’s keen to allow users to bring in RSS feeds from elsewhere, so MyMoodle could form the hub of an RSS based PLE. Helen Foster’s outstanding stewardship of the documentation wiki got a mention, and this is now integrated into Moodle as an online help system. The planned roles and permissions stuff sounds pretty good, with very fine grained control, cascading permissions and overrides. The challenge is getting the user interface sufficiently simple, without loosing any of the system’s flexibility. I’m also not clear that the team here, coming from an HE context, how this will work in schools, where there will be a need to associate one or two parent accounts with their particular child’s account, so that they can look at her/his online work but not that of other children. This gets more complicated still when one starts thinking about more collaborative work like wikis and forums, where any individual child’s contribution makes little sense out of context, and yet parents’ independent right of access to their child’s ‘educational records’ certainly doesn’t absolve the school of data protection and privacy duties in regard to the other children. I know it’s high up the DfES list to use ‘learning platforms’ to keep parents better informed about their children’s school work, but I worry that plenty of children might feel constrained in their contribution to online discussions if they know their folks will be reading all their posts, potentially out of context. It’s one thing to let parents know how their children are getting on at school, quite another to have them observing every lesson. Martin used the moot as the opportunity to go public with the news that Microsoft have funded his development of an (open source!) XML based database schema which will allow Moodle to run on MS-SQL (and also Oracle, DB2 etc, etc) database servers out of the box. Of course, this is simply MS maintaining the position of MS-SQL in institutions going with Moodle, but I think it augers well for those who’d been looking for some sort of integration with sharepoint based portals down the line. Moodle’s existing, slightly flaky, gradebook is moving to a centralised table, where modules will push grades out. I hope that Rob Barreca’s and Michael Penney’s work that allows manual editing of the grades (qv), crucial when you have a mixed online/offline use of Moodle quizzes, will either be integrated into the new interface or can be ported over there. Moodle’s planned support for formal metadata handling, building on the blog tagging system, is going to be important for Becta Learning Platform compliance, and for institutional knowledge management, with the ability to track resources and outcomes down to learning objective level. I’d love to see this integrating with the Teacher Plan module that’s being developed as a community contrib. When you couple this functionality with with planned support for repositories and community hubs, there’s going to be huge useabiltiy gains when you have Moodle being used across a group of schools, with each teacher being able to build up courses from ready made objects. 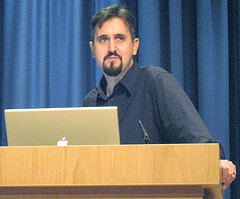 Although Michael Champanis’ Global Search module, funded through Google’s Summer of Code internships and mentored by Martin, might not be immediately exciting, Martin mentioned elsewhen in the Moot the option to build in RSS support here via obfuscated URLs like Google Calendar uses, thus creating highly customisable RSS feeds from Moodle courses, which could then be fed into Elgg, SuprGlu, EduGlu, Plex, or any other RSS supporting PLE. I’m still not clear that privacy concerns are addressed through simply hiding the URL, and it will be interesting to see how this can link up with the Roles stuff, but I still think this is pretty cool, especially if one can get round the RSS privacy/authentication issues by using IP authentication and hosting Moodle and the PLE on the same server. I think Martin has in mind lots more RSS support throughout Moodle. Despite his warning to not get distracted by shiny stuff, Moodle’s going to get AJAX suport for 1.7, using the yahoo user interface library. A Good Thing for those of us with long courses and lots of quiz questions. There’s also some cool stuff going on in the email interface, with the messaging system playing an important role here. This will, as an option, allow read/write access to Moodle via email or SMS, opening up lots of possibilities for offline and handheld use. Anyone know of good opensource E-Mail/SMS gateways that could run via a normal phone account and USB cable or 3G card? Similarly there’s apparently alrady ical support coded in to Moodle 1.6, but Jon Papaioannou never got round to writing the user interface before the release. The plan is to provide an API for student information, although I’m not sure that Martin’s notion of this tending to be used as a way of exporting summative grades once courses are complete really goes far enough, and much more fine grained access is going to be needed to do proper data-mining stuff, and link in to MIS or CRM systems. Also on on the roadmap is a serious e-portfolio system, perhaps based on the OU’s work here, and support for AV conferencing: elluminate (who helped us out with the HUGToB stand costs at BETT) are keen to be involved, but it makes more sense to go with something open source, probably using Red5’s flashcomm server: dimdim.com looks pretty exciting, and worth keeping an eye on. There was also some talk of reworking the resource module to include elements of eXe, which would, potentially, allow native authoring of SCORM packages. Personally, one of the most interesting ideas Martin mentioned was that of the Moodle Foundation, a charity with the mission of improving education in areas that can’t afford it, and a place where folks who would like to support Moodle but who’s accountants can’t cope with the idea of donating to open source projects can help. I think this is tremendously exciting stuff, and moves Moodle beyond the transformation of classes and institutions into, potentially, education systems. There’s some interesting work going on elsewhere in the open source world which touches on this: I’m thinking particularly of Mark Shuttleworth’sEdubuntu, with the vision of ultra low cost, high reliability computer labs even where the Internet doesn’t reach, and Nicholas Negroponte’s One Laptop Per Child project. Although there are going to be technological barriers to overcome, I’m sure there’s going to be plenty more cultural and change management ones, where teacher training and CPD will be important. The potential for collaboration and partnership between schools / universities in very different cultures that this opens up is inspiring, and I’m sure the Foundation could do lots to facilitate this – just imagine the gains to both sides by opening up Moodle courses to students at partner institutions, or even just through donating an existing course or two. As Martin had spoken for pretty close to two hours, the Q&A was postponed until later on in the day, which worked well as it gave chance to reflect a bit more on all this. Martin’s looking at the IMS standards stuff, but Moodle’s development isn’t being driven by it, although obviously interoperability is going to be important. And, of course, lots of people use Moodle now, so I wonder how long it will before Moodle becomes the defacto standard which everyone else has to interoperate with. Scary stuff, but with open source code and a well documented database, not beyond the wit of RM, MS and Capita. I was surprised at how luke warm Martin seemed about the Elgg-Moodle integration, which Catalyst have managed to do largely independently of MoodleHQ. Much of Elgg’s functionality is on the Moodle roadmap anyhow, and I think Martin would be keener to see e-portfolios particularly, but also blogging, tagging and RSS aggregation, happening inside the Moodle code itself – his take on e-portfolios appears quite different from that of Ben and Dave. I’m not so sure – Moodle is very much a teacher/institution led system, whereas Elgg places the focus much more on the learner, and to my mind portfolios, blogs and aggregation belong in the learner space: I can’t imagine many folk using Moodle instead of myspace, whereas with Elgg, this doesn’t sound quite so daft.